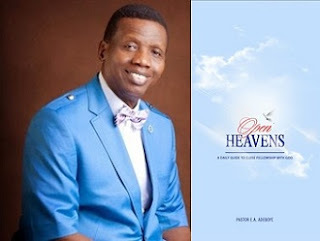 Open Heavens: Open Heavens 15 January 2018: Monday daily devotional by Pastor Adeboye – Daring The Most High God? Open Heavens 15 January 2018: Monday daily devotional by Pastor Adeboye – Daring The Most High God? Whenever I read the words of this scripture above, I tremble. It is quite astonishing to see mere mortals “flexing muscles” with the One who made them. You can be a ‘dare-devil’, but you better not dare the Almighty God; the end result will always be catastrophic for you. Today’s Bible text narrates a classical example of someone who dared to challenge his Maker: King Nebuchadnezzar. When Nebuchadnezzar commanded all to bow before the golden image he had set up, the Hebrew boys refused to bow, daring the devil in King Nebuchadnezzar. In response, Nebuchadnezzar dared the God of heaven and threw His children into the fiery furnace in defiance of God’s supremacy. However, the God of those Hebrew boys, who is also the God of all flesh, showed up in the furnace and rescued His children. It is unfortunate that those who, by the order of the king, threw them into the fiery furnace were all burnt to ashes. I decree that as it happened to those who threw Shadrach, Meshach and Abednego into the fiery furnace, so shall it be to all the enemies of God in your life in Jesus’ Name. Although Nebuchadnezzar temporarily repented of his folly after witnessing the awesome power of God, he still got a taste of God’s punishment down the line: he was turned into a beast for a season (Daniel 4:28-37)! May those who are challenging the Almighty God in your life be like Nebuchadnezzar, Pharaoh, Herod and all those who dared the King of glory throughout history. How can a mere mortal possibly challenge the Almighty God? It seems ridiculous, but amazingly, this happens on a daily basis in the world that we live in today. We see nations making law against the natural order set by God, judges redefining marriage contrary to what the Almighty God Himself instituted, and people calling to question the very existence of God. Such attitudes are not new. This defiant trend has persisted throughout all of history, but the sponsors of such assault on the Divine have always paid dearly for their actions. Are you daring God in any way? I hope your answer is no. Please, never you dare the Almighty God, not even through subtle disobedience. May the Lord cause you to be wise enough never to dare Him. Open Heavens 15th January 2018, Daily Devotional guide was written by Pastor E.A. Adeboye, the General Overseer of the Redeemed Christian Church of God, one of the largest evangelical church in the world and also the President of Christ the Redeemer's Ministries.